Pole #15 Street light is out. A repair request has been generated and sent to the company who services the street lights for the town. I also wanted to add that there are probably 15 full black garbage trash bags on the property and numerous other abandoned items that people are throwing on that place. Neighbors said they've tried to get something done many times and the owners are either out of town or totally ignoring this. It is breeding ground for vermin. Who pays the taxes on these abandoned properties? Somebody does. It's 8 Ckark St., and it has been reported several times withiut the issue being resolved. Soneone comes and looks at it and that's that. Very frustrating. Just keep reporting it then. The squeaky wheel gets the grease. Aspen Road street sign is missing at the corner of Aspen Road. We love our street’s new sign! Thank you! The stop sign on the SW corner of Bradlee and Phillips was knocked town. I propped it against a tree. Two separate work orders have been issued for these requests. Magnolia Road has no street sign at either end. This is a hazard for residents and emergency responders. A work order has been created for signage. The Stop sign is so faded it can not be seen. Please replace with a new sign with a new one. Lots of kids in this area. Thanks so much!! Your team is awesome! The stop sign at the corner of Pine St and Erie is missing. Several potholes and one large one at the corner of Martin street flaking apart. 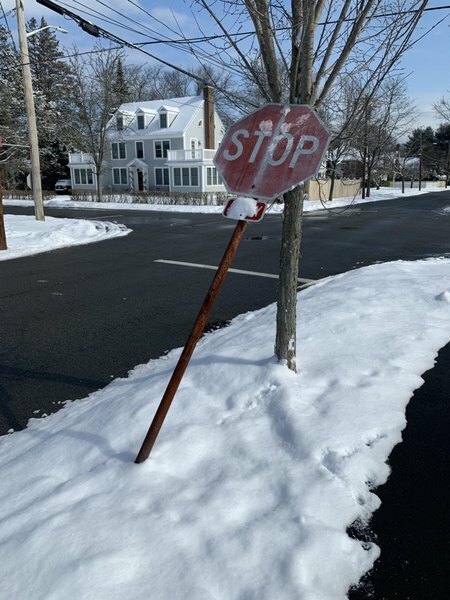 How does Swampscott announce snow emergencies? If they don't, how do I know if there is one?